Every year since 1954, the State of Michigan celebrates Michigan week in mid-May. It was started to promote the state’s many resources and accomplishments, hoping to instill pride in its citizens. I remember in elementary school learning about the official state tree, bird, flower, etc, and doing special projects centered on Michigan’s history that were amply displayed around our school building. But the lessons fell short of making me and my classmates aware of the rich history that lay in our own backyard, that of the city of Detroit. Yes, we were taught about Fort Ponchartrain and Cadillac, and a few other notable events, most in the 1700s when Michigan was mostly unclaimed wilderness, the impact of the automobile industry somewhat, and our city’s loyalties to professional sports (baseball, basketball, football and ice hockey to be exact). But some of the most significant changes in our city occurred between 1860 and 1920, years rarely discussed at any grade level in Detroit’s public school curriculum during the years I attended in the 1960s and 1970s. I remember learning about the Great Fire of Chicago in 1871, but I never remember anyone referring to the fire of 1805 that literally destroyed almost the entire city of Detroit. Following the fire, Judge Augusta B. Woodward designed a rebuilding plan for Detroit in 1807 based on the spoke model, similar to Washington D.C. That would explain many of the street names found in the original plan: Washington, Jefferson, Adams, Madison and Monroe Avenues. All of these streets still exist in downtown Detroit, however, Washington Street is now Washington Boulevard. 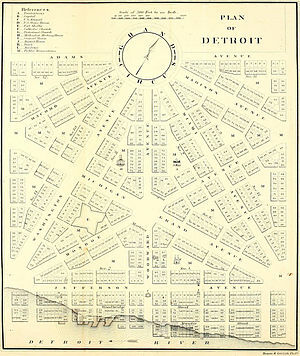 Although Woodward’s plan was not totally implemented as it appears in the original drawing, it is apparent that what is now the downtown core of Detroit was developed to a large extent along his specifications. Despite the years of changing development in downtown Detroit, the basic spoke still exists today as it did in 1890 when my great-grandparents arrived in Detroit. In 1890 Woodward Avenue was the center of the city, and was the heart of the shopping district, lined with a variety of business serving the city’s growing population. The street extended from the docks on the Detroit River north past Grand Circus Park, and eventually would radiate out all the way to the city limit of 8 Mile Road (also known as Base Line Road) and beyond to the city of Pontiac. Eventually Detroiters would differentiate themselves as “Eastsiders” or “Westsiders” based on where they lived in relationship to Woodward Avenue. The city was already growing along the transversing line of Michigan Avenue, in addition to 3 more transversing roads added to the plan – Grand River Avenue (to the northwest), Gratiot Avenue (to the northeast), and Fort Street (to the southwest). In 2004, the City of Detroit designed a new park in the heart of downtown and named it Campus Martius Park at the intersection of Woodward and Michigan Avenues, formerly known as Kennedy Square during my childhood. I wondered where the city came up with such an unusual name; little did I know that “Campus Martius” has a long history with Detroit. The name Campus Martius means “Field of Mars” in Latin in reference to where Roman heroes walked. In the 1780s, Campus Martius in Detroit was a drill ground for militia training. Judge Woodward not only included this area in his plan for Detroit, he used this area as the “point of origin” for the city’s coordinate system. Today you will find a medallion in the new park embedded in the stone walkway marking this point located in the western point of the diamond surrounding the Woodward Fountain, just in front of the park’s concession building. Standing on this marker, you are exactly eight miles south of Eight Mile Road. Today’s Campus Martius Park is much smaller than the park that existed in 1890, but today as in my great-grandparents day, it is a place where Metro-Detroiters of all economic backgrounds can gather and enjoy the outdoors. 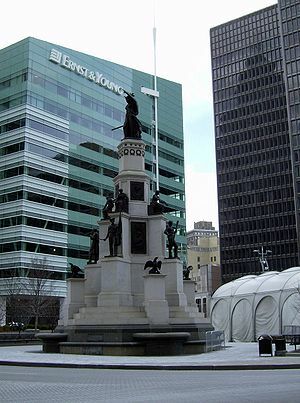 The most significant tribute of the State of Michigan to the Civil War is still located at Campus Martius Park, the Michigan Soldiers’ and Sailors’ Monument, as it was when my great-grandparents arrived. The monument was designed by Randolph Rogers, cost $75,000 to build, and was unveiled on April 9, 1872 (although it was incomplete – missing the statutes on the second-tier, which were added later in the 1880s). Inside this monument is a time capsule with a list containing all Michiganders who died in war from the Civil War to April 2005 in Iraq and Afghanistan. Located just east of Campus Martius Park is Cadillac Square Park. When I was growing up in Detroit this area was a large bus transfer station. But in 2007, the city developed this park on the site of the old Detroit’s Farmer’s Market – a site my great-grandfather, Arie Smouter may have known quite well. Like many of the Dutch immigrants in Detroit, Arie and his brother-in-law, Peter Streefkerk, were fruit peddlers at the turn of the century, and they likely sold their produce there. Today the park is also home to another Detroit landmark, the Bagley Memorial Fountain. 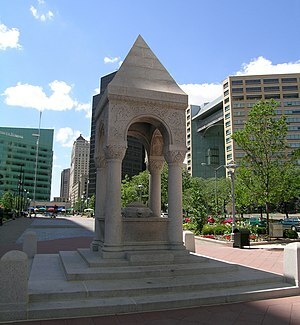 Originally located at Woodward Avenue and Fort Street, the fountain was moved to Campus Martius Park where it remained until 2000, when it was briefly placed in storage. The fountain was commissioned after the death of John J. Bagley, the 16th governor of Michigan (1873 – 1877), Detroit alderman (1860 – 1861) and Detroit Police Commissioner (1865 -1872) in accordance with his will. It was originally designed so that the people of Detroit could enjoy cold water distributed via the four lion heads in the center of the fountain. The lion fountainhead you see today is actually a replica, as the original one was stolen. A recent visit by a fourth cousin disclosed another landmark from the 1800s. Armed with photographs of her relatives from the early 1900s that were taken in Detroit that she hoped to deduce exactly where they were taken, I was puzzled by one. For some unknown reason I was knew that the picture of a female relative standing near a monument looked oddly familiar. The top of the monument was not in the picture, but there were two distinctive cannons on the base of the monument. Quite by accident, while doing research at the Burton Collection in the Detroit Main Public Library looking for an article on microfilm, another article caught my attention. Written about 1919 in the Detroit Free Press was an article on some of Detroit’s historic monuments, and one of the photos caught my eye – there were those 2 cannons. Turns out it is the Macomb Statute, erected in 1908 to honor Major General Alexander Macomb, who was born in Detroit on April 3, 1872. The monument is located across from the Book Cadillac Hotel at the intersection of Michigan Avenue and Washington Boulevard. I used to pass it when I drove home to Dearborn from my job in the Renaissance Center without every knowing its significance. Before I was married, I briefly lived in St. Clair Shores. My public accounting job found me briefly downtown and to avoid the traffic jam on the freeways going to and from work, I would take Jefferson Avenue (I lived a block from it) all the way to downtown. Along Jefferson Avenue, I would pass a huge stone monument on the waterfront just before the bridge to Belle Isle. Recently I recognized the monument from a photo in a history book on Detroit. It is the Hurlbut Memorial Gate. Built in 1894, at a cost of $30,000, it was once the entrance to Waterworks Park; by the end of the 1800s Waterworks Park had become the second most utilized park in Detroit. The park was first and foremost the site of the pumping station for the city’s water system in the 1870s, having replaced the original waterworks at the foot of Orleans Street. But the acquisition of the land and planning of the park presided over by Chauncey Hurlbut, then president of the Detroit Board of Water Commissioners, also included plans to use the 110-acre site as a public park. Following Hurlbut’s death in 1885, his will provided for approximately $250,000 to beautify Waterworks Park. The gate was substantially restored in 2007 thanks to a community fund-raising drive initiated by Tom Schoenith, owner of the Roostertail. However, the ornamental iron gate for vehicle entry and the statute of Chauncey Hurlbut are gone. Today the closest you will get to the gate is a view through a cyclone fence marked “Do not trespass”. If you have ever had a chance to visit Greenfield Village, an outdoor history museum in Dearborn, Michigan created by Henry Ford, then you have had a chance to view one other piece of architecture from Waterworks Park – the floral clock, now located just inside the entrance to the village. I think we even have some family pictures taken in front of the 8-foot-high clock during one of the many trips to the village when my daughters, Erin and Kristine, were young. The clock was invented by Elbridge Scribner, the first superintendent of grounds at Waterworks Park, and it was just one of his many floral designs that graced the grounds of the park. I wonder if my great-grandfather, Arie Smouter, ever took his family to Waterworks, as it was less than 2 miles from their house on Elmwood Street near Jefferson. The park was also less than 1/2 mile from the first house my grandparents, Cornelius Reyst and Jennie Smouter Reyst, rented on Hibbard Avenue around 1914. Located very close to the affluent subdivision, Indian Village, it appears the park attracted the well-to-do by the attire that the men and women were wearing in several old photos I found during my research. So next time you visit Detroit, try to look beyond the blight of boarded up homes and over-grown vacant neighborhood lots and ghostly shells of relics, like the Michigan Central Railway Station and the Packard Plant, and you may see hints of Detroit’s historic past before they disappear.